Asus pulled off a big surprise a few weeks ago by announcing that it was going to offer a budget gaming notebook for less than Php 40k — the Asus Gaming X560. This understandably left us quite curious about what a laptop at this price range could offer; especially one that had the word “Gaming” in its name. 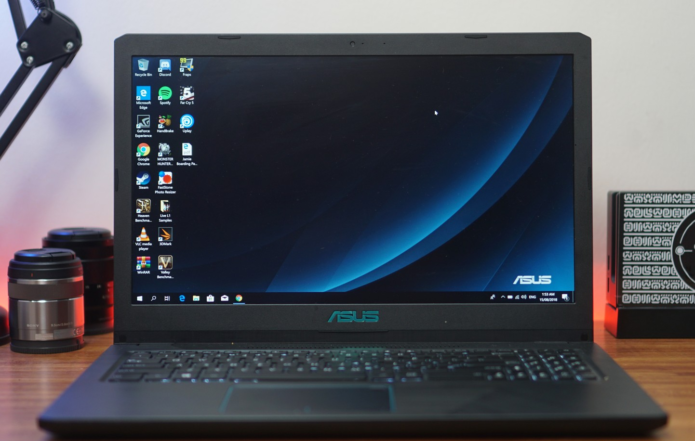 We were able to secure a loaner for the exact model they were offering for Php 39,995 but got our hands on its bigger brother instead — the Asus Gaming X570 — and were able to put it to the test. Let’s jump in. Starting with its exterior. Does It Look the Part of a Gaming Notebook? Well, yes. Most brands have started to gravitate to less flashy designs for the laptops that they’ve made for gaming and the X570 definitely fits the bill. The unit is black with touches of teal (or as their marketing material says, Reaper Black with Lightning Blue edges) to give it a nice pop with the lid getting the same treatment that off recent notebooks in Asus’ Republic of Gamers sub-brand. They, of course, had to cut corners somewhere to get the price point to where they want it to be and that’s in the material choice for this device. You’ll find no aluminum or magnesium in this chassis, like the recently announced Asus ROG Zephyrus S, only polycarbonate plastic and you can feel it from the get-go. This gives the lid a tiny bit of play and that makes us want to give it some extra TLC by placing it into a sleeve before placing it into a backpack. On the upside though, this made the X570 lighter than the notebook we have with us on a daily basis; weighing in at 1.9kg. A huge plus for us. How Are the I/O Ports on the X570? You’ve got your standard I/O ports that you’d typically find on most full-sized notebooks. You have a USB Type-C port, USB 3.0, two USB 2.0 ports, HDMI, Ethernet, and a headphone jack. Sadly, there’s no SD card slot so you’ll have to bring a card reader to store photos or footage from your camera on to the laptop. There’s a microUSB port though. How’s the Display on this Notebook? You’ve got a 15.6-inch panel on the X570 with decently sized bezels. A big surprise for us is that this model of the Asus Gaming X series had a 4K display, which we weren’t expecting at all, plus had a 100% sRGB color gamut. It was great for everyday use and I, personally, enjoyed having more room to work on Premiere Pro while editing videos for the YouTube channel; making it a real shame that they didn’t have the aforementioned SD card slot. The speaker on the X570 generate a good amount of volume but they can sound a little tinny and there’s definitely some distortion once you pass the 80-percent mark as well. We recommend using a pair of headphones to maximize enjoyment when gaming or just watching something on Netflix or YouTube. Does the Keyboard Feel Good to Type On? Honestly speaking, it’s not the best experience we’ve had on a laptop that we’ve handled from Asus but it is decent. You’ve got a good amount of travel at 1.4mm and the keys are spaced comfortably as well; except for the numpad that they tried to cram into the notebook. Again, since the body is made out of plastic, you can expect a bit of play if you’re a little heavy handed but it’s really no surprise. No RGB here as well but the keys are backlit for those late night gaming sessions in dark. The trackpad is precise and has a fingerprint scanner on the upper-right hand side, which keeps your laptop a little more secure thanks to Windows Hello. It has a pretty good margin of error and if we’d have to give a number to it, it’ll read your prints right about 7 out of 10 times. How’s the Performance on the Gaming Laptop? Under the hood of the Asus Gaming X570U is 8th Generation Intel Core i7-8550U processor that’s paired with an ample 16GB of RAM and an NVIDIA GTX 1050. Our review unit also came with a 512GB M.2 SSD and a 1TB HDD. Honestly, the specs on this notebook are pretty impressive; given what they’re expecting you to pay for it. We had no trouble editing videos on this notebook and it pretty much zipped through other productivity tasks as well. You’re not here for that though. You’re here to see how it did in the gaming department and it delivered the performance we were expecting out of a notebook with this hardware configuration. Before that, have a look at some synthetic benchmark results. With that out of the way, let’s look at a few gaming benchmarks. First of, you’re going to want to immediately set games to 1080p to take better advantage of the GTX 1050 that X570UD has onboard since that is the sweet spot for this card but you’re definitely going to want to keep setting pretty low on triple A titles as well. We tried it on Monster Hunter World at Medium Settings and you’re getting an average of 35 frames per second with a maximum of 50 fps and a minimum of 2 (though that’s probably just the 1-percent). It’s completely playable but you’ll notice a few dips here and there. Another game we tested it on was Far Cry 5 on High and we’re seeing an average of 34 frames per second. You’ll definitely want to dip that down more to get better frame rates and make it run a little smoother. Temps hovered at around the 85-degree mark, which isn’t too bad at all. Juicing up this gaming notebook is a 48Whr battery. If you’re looking to game on-the-go with the Asus Gaming X570UD, you’re going to have to make sure that you’re going to be near a power outlet as anything that requires the notebook to exert itself a lot will have you without any juice in a little over 2 hours. You should easily get double if you’re simply going to browse through the web or watch a couple of videos though. Should You Get This Notebook? At Php 59, 995/$1,011 for the configuration that we got this in, the Asus Gaming X570UD is quite compelling for what it has to offer and with the welcome surprises it has as well. It’s a decent notebook for productivity and a bit of gaming but may require a little extra care if you are planning to bring this laptop with you all the time but there’s more to love about this notebook. If a 4K display is something you can pass on then we actually recommend getting the Full HD variant of the X570 over this one. It costs Php 53,995/$1,011. You’re sacrificing some color accuracy with this one and you might get a little frustrated by the lack of an SSD as well. If you’re really tight on a budget, you’re also going to want to check out the X560 that starts at Php 39,995/$749.